In camp at Site 37 at dusk the first night. So we finally got a nice weekend to take our new camping trailer out for its maiden voyage. 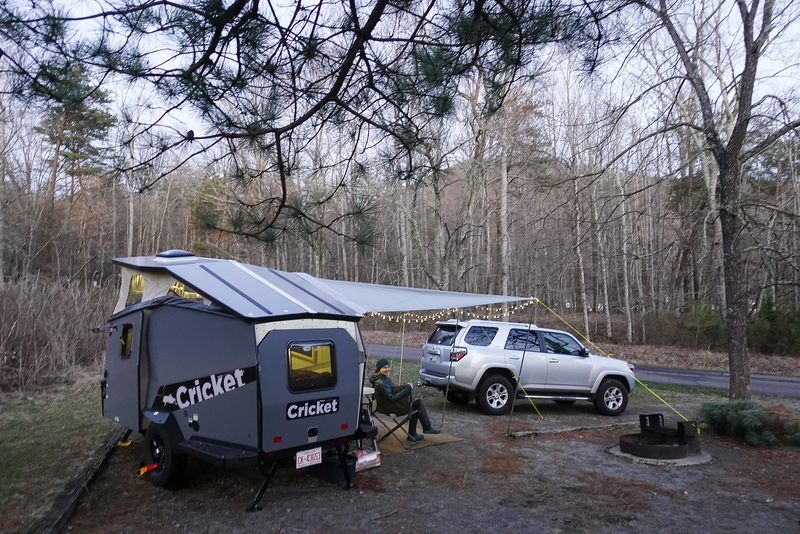 We wanted to stay close to home but still have a place for a good hike and a peaceful campsite, so we headed to Stone Mountain State Park in Traphill, NC, about an hour from home. SMSP is home of Stone Mountain, a huge exposed granite dome, and it’s popular among climbers and hikers. It turns out this was a very popular weekend for camping at Stone Mountain, too. Every site in the large RV loop (with electric and water hookups) was taken, mostly with giant fifth wheel campers. We had a site in the smaller A loop, mostly tent sites but with a few that would work for small campers like ours. 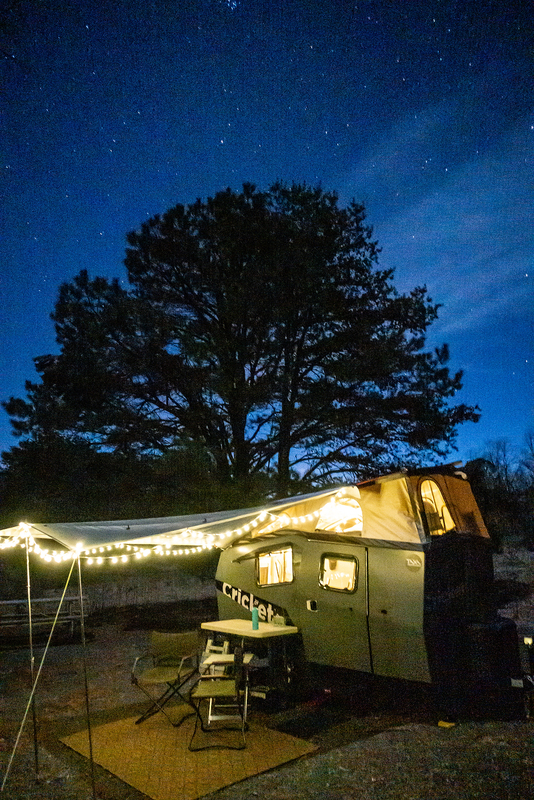 On Friday night we won the highly coveted “smallest camper in the campground” award, probably by a good ten feet or more, but on Saturday night a couple from Virginia had a very cool tiny teardrop camper in site 55, the most private site in the RV loop. TL;DR — the Cricket was great, we had a fun short hike and a nice lunch in Sparta, and the weather was terrific if a bit chilly. Longer version — Since we were taking this trip to test the various systems in the Cricket, and make sure we knew how everything worked, I’ll just write about that. This is the sort of information I wanted when we were looking at campers. 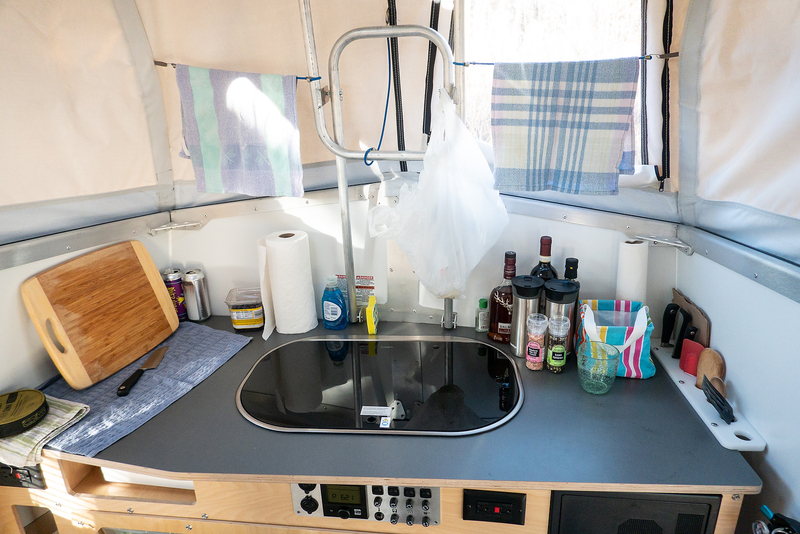 One of the prime features of the Cricket is the kitchen, located right up front in the tallest area of the camper. The birch plywood construction is striking, and the overall look is of something made by a very practical engineer. There’s lots of storage in the kitchen area. We had some plastic boxes that fit in the wide shelves, and found others for the smaller compartments. The big blue box at the right is our pantry. The Dometic refrigerator is barely in view at the lower left. You can also see the four round black hot air outlets for the Truma system, and the cover for it at the lower left. The Truma control panel is top center, along with light switches and a fuse panel. Here’s a view of the countertop, with the glass cover closed over the stovetop and sink. There’s enough room for food prep as well as storage of commonly used items. Note the knife and utensil rack at the far right. 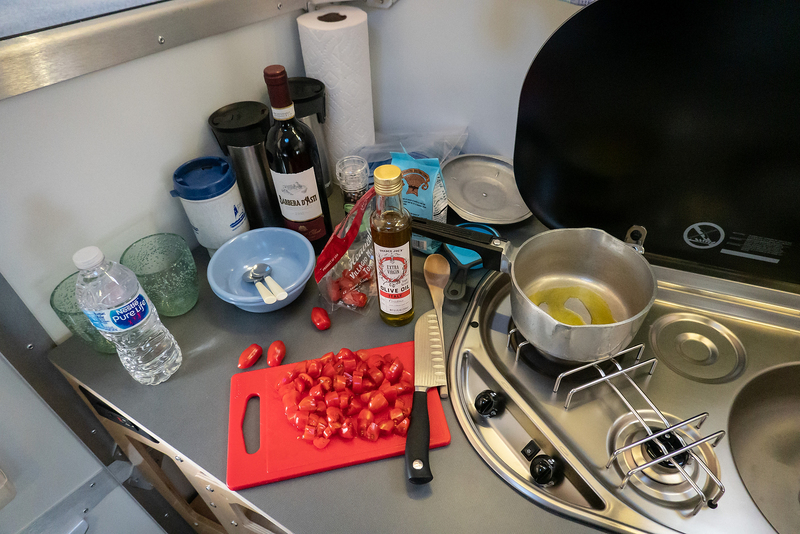 And here’s the kitchen in use, making farro with tomatoes and garlic. A tasty and quick one-pot camping meal. That stovetop will easily handle a 12-inch saute pan, too. Cooking inside the Cricket is enjoyable. There’s good natural light with the windows in the pop-top open, and a decent LED light strip over the counter. There’s enough room to prep and cook, within reason. We did discover that the smoke alarm works quite well, as it sounded several times while cooking breakfast. Opening the windows and turning on the ceiling fan to pull air and smoke out fixed this immediately, and also showed us how much air the fan can move even on the lowest setting. Well, this is the important part, right? If we’re replacing our tent, it needs to be comfortable to sleep in. The cushions in the Cricket are, er, exceptionally firm. Not quite as firm as plywood, but close. The good news is that they should last forever. The bad news is that we can’t sleep on them as-is. So for this trip we tried the very soft 2-inch memory foam mattress topper that we use on our bed at home. A standard queen size topper fits just fine, though we had to tuck it in a little at the foot of the bed where it narrows a bit. This added a lot of cushion, but this topper was too soft. We’ll try again next time with either a 3-inch topper or one that is firmer. One of the issues with using a second mattress is, where do you put it? You can see our solution in one of the photos below — we roll it up and push it to one side, or down to the bottom of the bed, depending on which side of the storage area we need access to. It got in the way a few times, but it worked. The quilt is our regular backpacking quilt, a 20-F rated Accomplice two-person quilt from Enlightened Equipment. We find it works very well down to about freezing. EE makes terrific backpacking quilts in many styles and temperature ranges, and they’re much lighter than most sleeping bags. This weekend was a good test of living in the Cricket. It got down to freezing at night, and it was very windy Friday night and all day Saturday, so we ended up preparing and eating meals inside, and hanging out, changing clothes, organizing gear, getting ready to hike, etc., all inside the small interior of the camper. 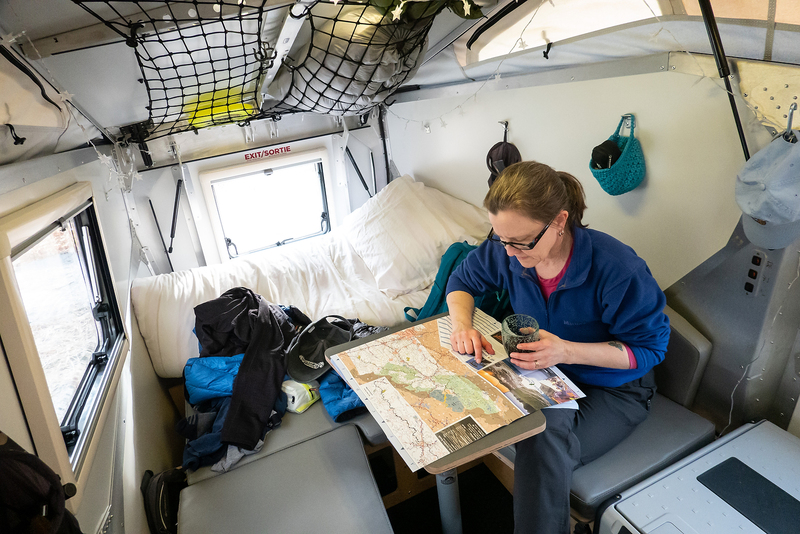 All in all, it works, though it takes some planning and organization given how the storage works under the bed, and how small the seating area and table are. NA checking out future trips on the tiny table inside. There is more storage space in the Cricket than I thought when I first looked at it. 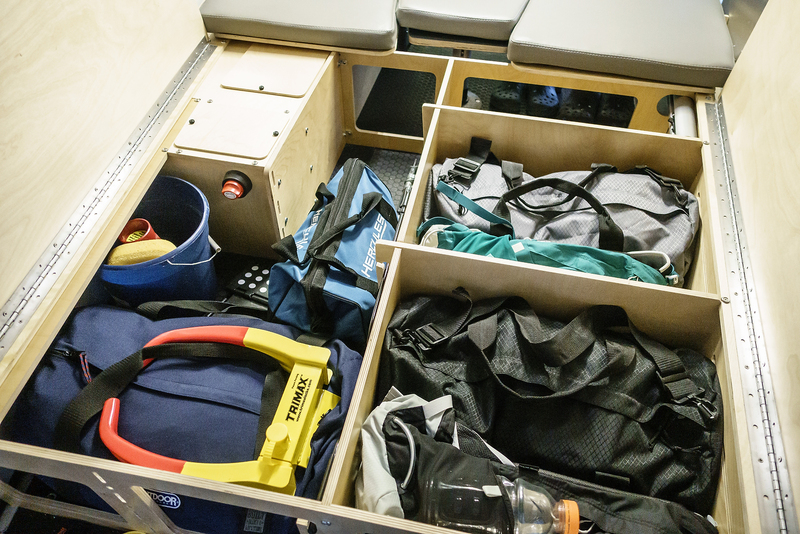 The under-bed storage area easily holds all our personal gear and clothing (on the right — one medium duffle and one Osprey day pack per person), and plenty of RV gear and tools (left.) We’re not using all the space under the bed, and could easily carry enough stuff to be gone indefinitely. When I started thinking about all the things we used to carry in the car for tent camping, I quickly realized that all of those things were in the trailer: Tent, check. Kitchen bag — we have a whole kitchen! Sleeping pads, bags, pillows. Chairs, a small table, a screen house for cooking and hanging out. Personal gear, clothing, toilet and shower stuff — it’s all in the Cricket. It makes packing and preparing for a trip much faster and easier. 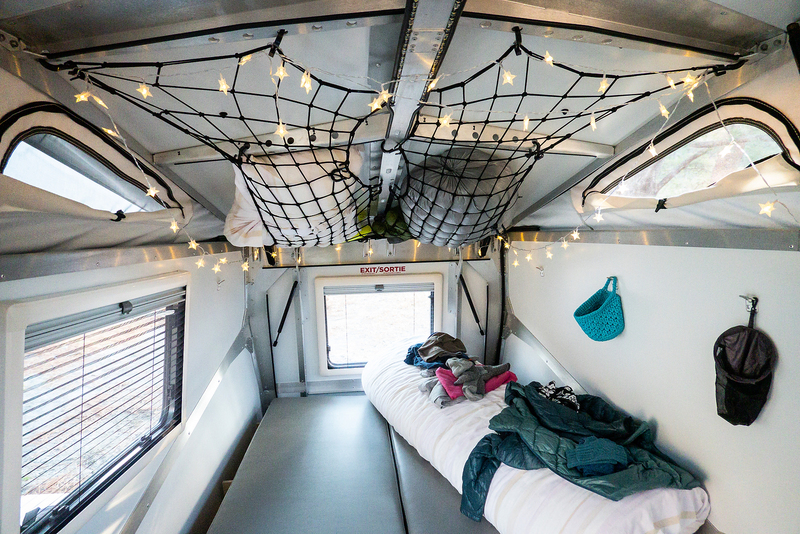 Our pillows and down quilt stow in mesh bungee nets in the ceiling. These are 15×30-inch cargo nets from Amazon, and they attach to various holes placed in the frame for this purpose. We can also stuff our jackets, hats, down booties, and other lightweight items up here. (The little string of star lights plugs into the USB outlet on the battery box, and provides a lovely warm, soft light in the evening. That also came from Amazon.) The mattress topper rolls up and gets pushed to one side or the other. The Cricket, like most RVs, has a dual 120 AC and 12 volt DC power system. Plugged into power at home or at a campsite, and the power converter will run the various systems, keep the battery charged, and provide power to a couple of household outlets. Unplugged, everything runs off a pair of Group 27 RV/Marine AGM “house” batteries, 79 amp hours each. These are sealed lead acid batteries. Given the characteristics of this type of battery, we can use only about half the stored power before needing to recharge. 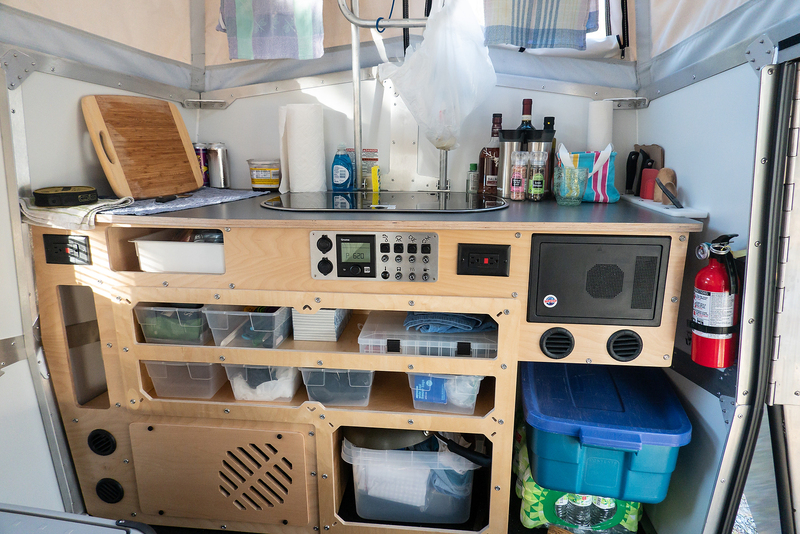 The batteries run the fridge, the LED lights, and the combination heater/hot water system, as well as offering several USB outlets for charging devices. I had some concerns about battery usage with the 12v refrigerator. On this trip we had the fridge running the whole time, plus the Truma heater all night, along with the LED lights and some USB devices. But after 48 hours of running on the batteries, our output voltage was still at 12.3 volts, which is great. (We have to shut things down if the voltage drops below 10.5v, or we’ll damage the batteries.) I expect we’ll easily be able to go off the grid for four days or more with no problems, which covers pretty much any music festival and most of our camping trips. It was plenty cold enough to run the Truma both nights, and what a joy it was to wake up and turn up the heat a little before getting out of bed. For long-time tent campers and backpackers, this verges on luxurious, or maybe even decadent. Mmmmmmm. I could get used to this. We didn’t run any water through the plumbing system on this trip, both because of the below-freezing temperatures overnight, and to simplify our first trip. 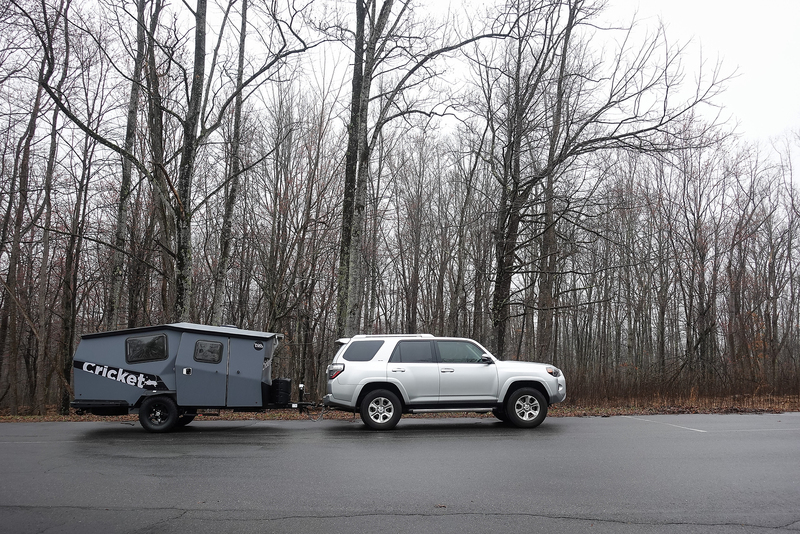 The Cricket towed easily behind our 4Runner. It was stable at 70mph on the interstate, and just as stable on a hilly, windy two lane road headed up into the mountains. It tracks well, the brakes work, and the 4Runner barely notices the extra weight. Backing it into the campsite was fairly easy, though the driveway was more sloped than I expected. 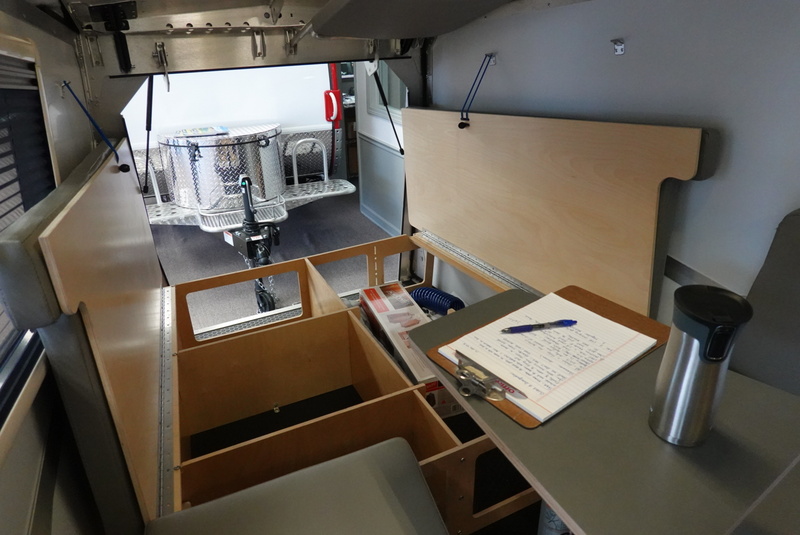 When we went to level the camper, we realized that the front stabilizers would not touch the ground — too much slope. Next time I’ll have a couple pieces of 4x4s or 6x6s with me. But this time we turned the Cricket sideways into the site, which made for some interesting maneuvers with the truck. Setting up the Cricket was easy and fast. Level it side-to-side and chock the wheels, unhitch it from the truck, level it fore-and-aft with the jack, then put down the stabilizers. Pop open the top and it pushes up easily from the inside and latches into place. We set up the included awning using some small bungee cords and carabiners, three poles, and three long guy lines. It was tricky to line it up properly to keep the flap over the top edge of the camper, and I have some concerns about water flow in heavy rain. Once we got the carpet laid out, and some comfortable camp chairs, we were all set to enjoy a lovely evening in camp. 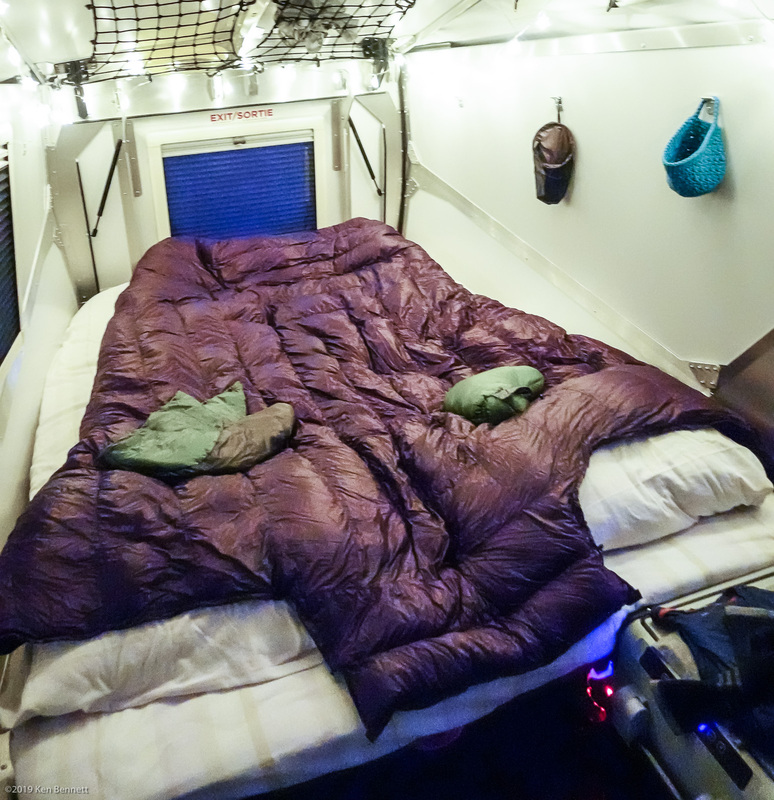 The string lights are LEDs running from a small battery pack that takes three AA batteries, and they are attached to the tarp with clothespins. One 33-foot string was enough to cover the entire tarp and provide very nice light after dusk. Shot handheld at ISO 6400 with the tiny Sony RX100, the photo is noisy but captures the feeling of being there.